Sean P. Means | The Salt Lake Tribune Yeno Oliver, 13, a student at Bryant Middle School in Salt Lake City, completes an electrical connection to activate sounds on the "hands bot," one of three "beat bots" assembled by Spy Hop Productions, Thursday at the Utah Arts Festival at Library Square. 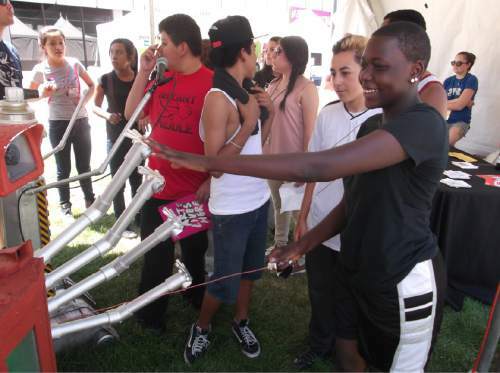 With spare parts and a little computer technology, a trio of robots are helping kids make music at the Utah Arts Festival. Spy Hop Productions, the teen-driven music-and-film nonprofit group, has assembled three "beat bots" through which young festivalgoers can create musical compositions on the fly. The first bot has a dozen pre-programmed bass lines, which can be activated by inserting metal cartridges (actually, they&apos;re old hard-drive cases) into the right slots. The second bot comes equipped with a microphone, into which one can rap, sing or make beat-box noises  and, with a push of a button, the passage will repeat on a loop. The third bot, the "hands bot," has eight different sounds, which are activated when someone puts on a foil bracelet and touches one of the metal hands  with the bracelet wearer&apos;s body completing an electrical circuit. "Isn&apos;t it awesome?" gushed Rowan Stigner, one of Spy Hop&apos;s robot builders. "It&apos;s every different type of audio experience." The beat bots are situated near the Make Salt Lake tents, near The Leonardo on Library Square, and reflect the software-meets-hardware DIY attitude of the Maker movement. Adam Sherlock, Spy Hop&apos;s community program manager, said young people are familiar with the tools of the Maker movement, and seeing the technology melded with handmade robots  "tinfoil and tape and a lot of junk," as he put it  gets their curiosity going. "They get into critical thinking and say, &apos;Show me how it works,&apos;" Sherlock said. "In our childhood, it was enough to play a video game. Now, they&apos;re so empowered to hack into things … and go, &apos;Do what I want it to do.&apos;"